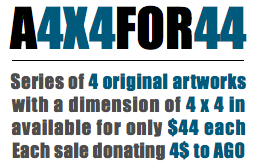 I recently came up with an idea to get me to start painting a little more often : I call it 4 BY 4 FOR 44. The goal is to paint a series of small and affordable original paintings around random themes. All the painting will have the same dimensions (4 by 4 inches), all will be sold for $44 and for each sold piece of artwork, $4 will be donated to the Art Gallery of Ontario, as a way for me to pay it forward and support the arts in the city. My first series of paintings will soon be on display at Bampot Tea. I was fortunate to meet the owners of the venue who were interested in displaying them in their shop. How awesome is that!? So if you're curious, go check them out. They make really good Chai Tea and have great little dishes. Last time I had Halvas. It's a dessert using ground sesame seeds, quite delicious. 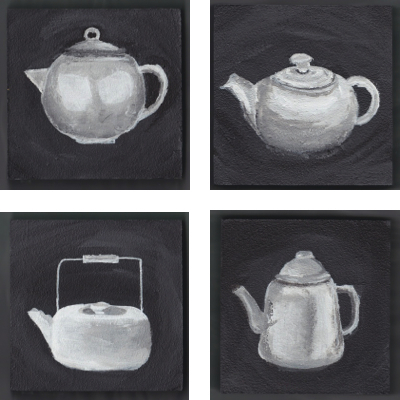 The teapot paintings pieces were made on wood panel using acrylics. I plan to produce a lot more mini artworks on various themes. To see more of the artworks from this series as they are being produced, just click on the 4X4FOR44 tab and come back often. m j @ m 2 j l s t u d i o . c o m.